Are you living around Edinburgh ? 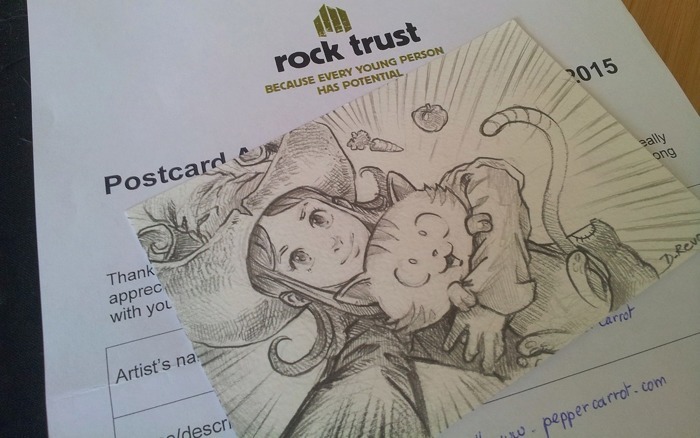 If yes, then it's your chance to get an original pencil artwork of "Pepper&Carrot doing a selfie" ( photo above ) and help a Charitable Organization. The Rock Trust works to help young people who are homeless across Edinburgh and the Lothians. To raise money, they organize each years a Post-card exhibition with artworks of volunteers artists. It's the third time I participate. This year, 170 postcards , and the exhibition already started ! .. Exact place, hours, and more informations on their blog post . congratz to the Rock Trust team ! I'd pay for one or more plus shipping to the U.S., if you could do that and donate the proceeds for me. They're adorable!